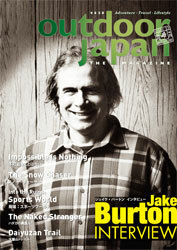 The March-April edition of Outdoor Japan was my second time to present a feature article on haikyo, including photographs. This time I focused on Sports World, my all-time favorite haikyo. They did a wonderful layout in spooky black with the photos given ample space to shine. In addition I had the chance to go through the copy of the whole magazine with Gardener the editor and help out with proofing in general, which was great fun. You can buy back-issues of OJ and of course Subscribe to future issues here. Congratulations, Mike! How many pages did you get? Thanks Florian, I think I got about 4 pages, though am not sure as I don`t have a copy of the mag myself.